Our mission at Alternative Mobility is to give you the access that you want. This means we carry any particular type of sporting chair to meet all your needs, whether it is playing tennis, basketball, or competitive handcycling. We promote exercise and general fitness through activities that are possible through our products. 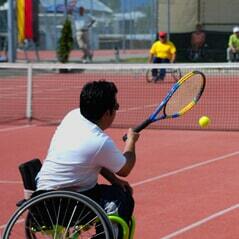 A part of our offering is being able to give the accessibility to the sports, exercise, and events that you want to do. This means we offer racing equipment, basketball chairs, recreation cycles, tennis chairs, rugby chairs, competitive handcycles, extreme sport chairs, indoor roller products, and so much more. Our products are designed with ultra-lightweight materials to ensure that you will have the competitive edge at whatever you compete in.